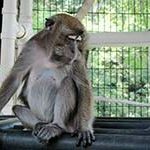 Lily, a long-tail macaque, was one of our first former pet residents after Gizmo, arriving in 1990. Lily was instrumental over this past summer during the introduction of Bubbles into her group, which also included Gizmo and Ciera. Lily and Bubbles quickly became friends, and Lily’s personality and close relationships with everyone in the group facilitated grooming and bonding behaviors among the whole group. Lily had such beautiful eyes and would raise her eyebrows and flash her bright white “eye shadow” to greet and lip smack at her favorite people. One of her favorite treats was peanuts, which she would find in her forage pool and squeal with delight as she picked through the shavings. Lily, we will never forget your beautiful eyes and your sweet daily greetings. You were such a special monkey and will always have a special place in our hearts.